Huang Shan (Yellow Mountain), located in eastern China's Anhui Province, is famous for its countless jagged rock towers, beautifully wind-sculpted pine trees, and seas of swirling clouds. It resembles a sumi painting more than a real place. It is a subject of traditional Chinese paintings, literature and modern photography. It is UNESCO World Heritage Site, and one of China's major tourist destinations. This image belongs to the travel and nature stock photo library. This stock photo of Huangshan Mountains is available for licensing for commercial and editorial uses including websites, blogs, books, magazines, brochures and advertising. Restrictions may apply for images which contain third party copyrighted material or sensitive subjects. Photos of artwork are for editorial use only. 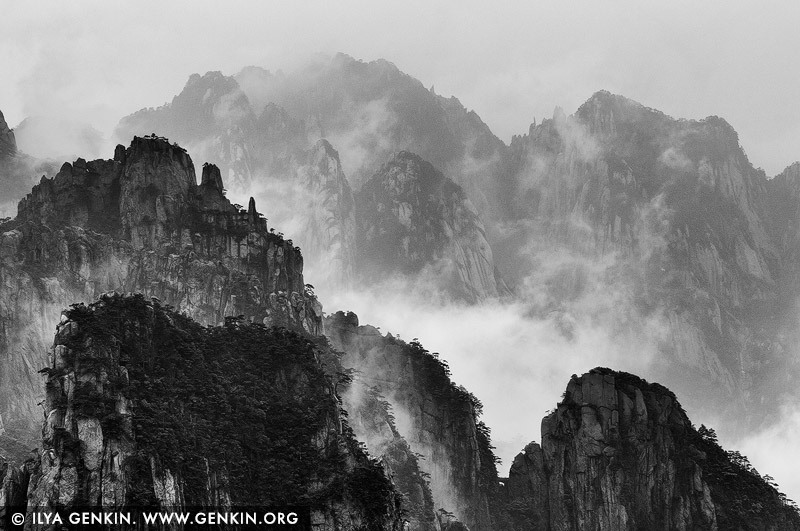 This image id CHINA-HUANGSHAN-0034 of Huangshan Mountains, is copyrighted © by Ilya Genkin. This is not a public domain image.